Great battery, very fast service. Great product, good price and superb service from Tanya. Great delivery, packaging very clever. And working well. However, to get the terminals bolted on, one needs the fingers of an extremely dexterous small child. The nut is a nightmare to thread onto the bolt as there is so little room and the bolt can only come in from one direction. Battery seems to work fine on my Honda CB125 TD. I originally received a dud which wouldn't charge before sticking it in the bike but the team sorted me out with another as soon as I flagged it which worked perfectly. I went off the websites replacement options for my bike which I would advise to maybe triple check against your bike. My original was a lot smaller then this replacement but I'm a maverick and threw it in regardless. Overall great experience, fast shipping and would use again. Thanks! Good price and direct replacement. Arrived safely and quickly. The battery is great, but the service was outstanding. Amazing communication and clear instruction. Top class. good quality product. excellent value for money. First class service, Quick delivery and quality product, Very pleased! 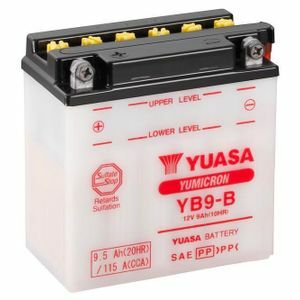 a wide selection of batteries, good prices and rapid turnaround. recommended. I needed a good quality but reasonably priced battery to give life to an unloved Honda. The original, unsurprisingly was dead after standing unused for 27years. The battery arrived very promptly, well packaged and with all relevant bits included. I filled and charged it overnight. The battery fit was spot on and soon had the old Honda purring like a kitten.